Assist with training the next generation of engaged scholars. There are 5 modules in total, focusing on such issues as effectively working in groups, successful partnerships, negotiation techniques, and so on. The modules encourage students to critically reflect on the content. The modules provide students with concrete examples that illustrate abstract concepts and ask students to come up with their own real-life instances. The curriculum is developed by experienced practitioners and researchers who have worked in the university-community engagement field for many years and who previously worked in local, state, and national organizations. The Tools of Engagement initiative is a collaboration between University-Community Partnerships, the Center for Service-Learning and Civic Engagement, and the National Collaborative for the Study of University Engagement. 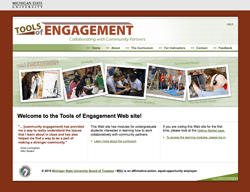 Visit the Tools of Engagement Web site.